Maybe it's the weather, maybe it's the time of year, more likely it's my propensity to jump in with both feet when I get excited about something. Having left the walled garden of my blog to explore the larger world of the online beading community, I just can't quite seem to control myself. I seem to be joining things left and right, and enjoying it immensely. 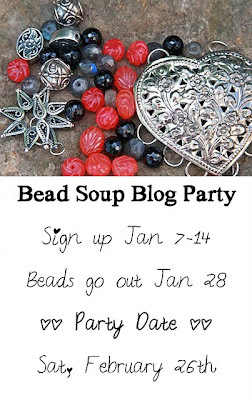 The latest - Lori's Bead Soup Party - a bead exchange and an virtual studio tour. We'll all be paired up with another party goer and send each other bead packets, with specialty beads, a focal "bead" and a special clasp. The Flickr feed from previous Bead Soup Party's is really impressive. 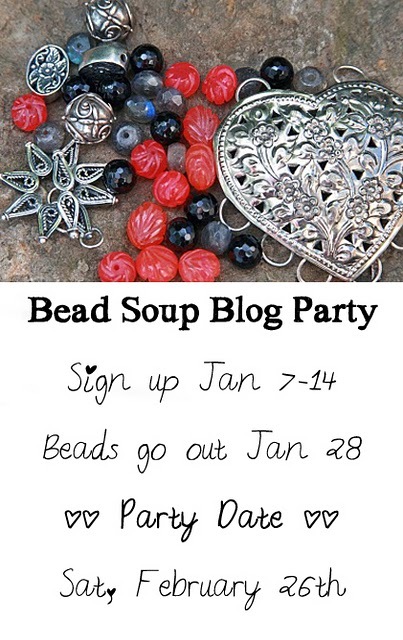 We then have until Party Date, February 26th to make something with the beads and post what we've made on our blogs. Then it's party time where we all zoom around looking at eachother's blogs. 210 people have signed up for the party. I'm both excited and nervous. Wondering who my partner will be and hoping she'll enjoy my selections. Great article thanks for posting. Beading is a hobby that I really enjoy.